The Circuit Civil Court ruled last week in favour of Sarah Doupe over an incident that happened in 2013. 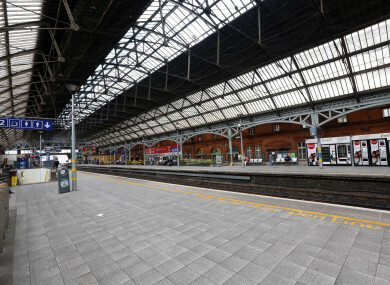 IRISH RAIL HAS appealed a judgement which saw it ordered to pay €16,000 in compensation to a passenger who sued the company for assault and false imprisonment. Judge Francis Comerford, in the Circuit Civil Court, awarded Sarah Doupe the sum in damages and said that Irish Rail was guilty of making “unwarranted slurs” against the 26-year-old, with an address in Maryville, Skerries Road, Lusk, Co Dublin. The court heard she was among a group of black-tie revellers who’d stepped off a packed Dart station at Pearse Station on 5 April 2013. Although she had a ticket, she became involved in an altercation with Irish Rail staff member Darren Williams. He had just fined a man who did not have a ticket, who had then shouted abuse at him. Doupe asked for Williams’ name and was refused. She then reached for his identity badge on a lanyard around his neck and, she claimed, had been pushed backwards by him. She had taken a photograph of Williams on her phone and had refused to delete it. Then as she attempted to leave the station a number of staff and security men had been instructed to and did detain her on the ramp. In court, Doupe denied that she had threatened Williams or had threatened to bite him. Judge Comerford said he was accepting she had been detained because she had refused to delete the photograph and had been held until the arrival of gardaí a few minutes later. He dismissed her claim of assault. Awarding Doupe €16,000 damages for false imprisonment, Judge Comerford said if there was a policy of keeping identities confidential there had to be a system allowing a member of the public to be able to identify the person they were dealing with. Neither Irish Rail nor the solicitor for Doupe had official comment on the matter when asked by TheJournal.ie. The appeal is due for mention on 5 March. Email “Irish Rail appeals after passenger granted €16k in damages for false imprisonment”. Feedback on “Irish Rail appeals after passenger granted €16k in damages for false imprisonment”.